This is an extension for the Affiliates, Affiliates Pro and Affiliates Enterprise. When activated, it automatically creates affiliate accounts for new users. It also provides a function to create affiliate accounts and for all existing users. Once installed and activated, the plugin automatically creates affiliate accounts for new users. 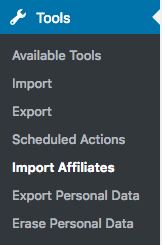 The Import function leads to the section where affiliate accounts can be created for existing users. It is also available under the Tools menu. The section presents itself as a simple interface where you can import affiliate accounts for all existing users that do not have an affiliate account related yet. The number of accounts created can also be limited. If no maximum is provided, it will try to create accounts for all users that have no affiliate account related (or had one related in the past). A successful run will provide information about the affiliates created.